The listing of modelers on this page was built in 2006. Special emphasis is place on what processes are relevant to simulating carbonate buildups. This page is divided into four sections. Recommendations on how to build a computer model or refine an existing carbonate model. This section includes a list of books that might be consulted when building a model. State of the art of stratigraphic modeling describing activities of 20 modelers who have made important contributions to the understanding stratigraphic simulation of both carbonates and siliciclastics. For each modeler, we may have addresses, e-mail addresses, websites, short descriptions, references and selected papers where applicable. These are followed by extensive lists of other references on carbonate and siliciclastic stratigraphic simulation and the scientists including those of the CSDMS. References for processes and sedimentation including carbonate erosion, transport, shedding, peloid formation and other modern processes. Includes a list of references on quantitative data from modern carbonate settings that should be useful in building a model. This reference list is from a report entitled "Assessing dimensions and controlling parameters in carbonate depositional system" by Gregor Eberli and others at the University of Miami. These references should help when building algorithms that simulate various processes. CSDMS and the diverse community of experts assembled to promote modeling of earth surface processes by developing, supporting, and disseminating integrated software modules that predict the erosion, transport, and deposition of sediment and solutes in landscapes and their sedimentary basins. 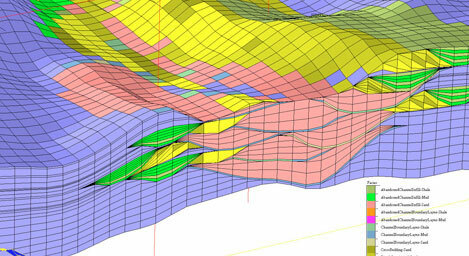 For a more up to date listing the Community Surface Dynamics Modeling System (CSDMS) provides access and information on computer modelers of sedimentary systems and processes and the programs they have built. The CSDMS site links to modeling efforts underway across the world and you can make connections and collaborate with other efforts as you think appropriate. CSDMS is working internationally to build an integrated modeling community. This community supports a modeling architecture and deals with eclectic systems involving hydrology, nutrients, sediment (including Carbonates), ecosystems, glaciers, oceanography, weather, etc. -- earth-surface dynamics. The CSDMS goal is to enable models and components to be combined in unique ways to answer diverse questions be they stand-alone models, components and compliant contributions. CSDMS provides opportunities with NGO’s, agencies, and industry partners.